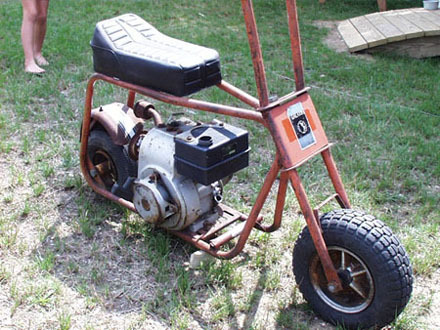 Upon learning a doleful story of my pining for a minibike in my youth, a friend of mine, Paul Porlier, plucked this little gem from one of his buddies where it had apparently been rusting quietly for many moons, exposed to the elements, abandoned to a certain death. 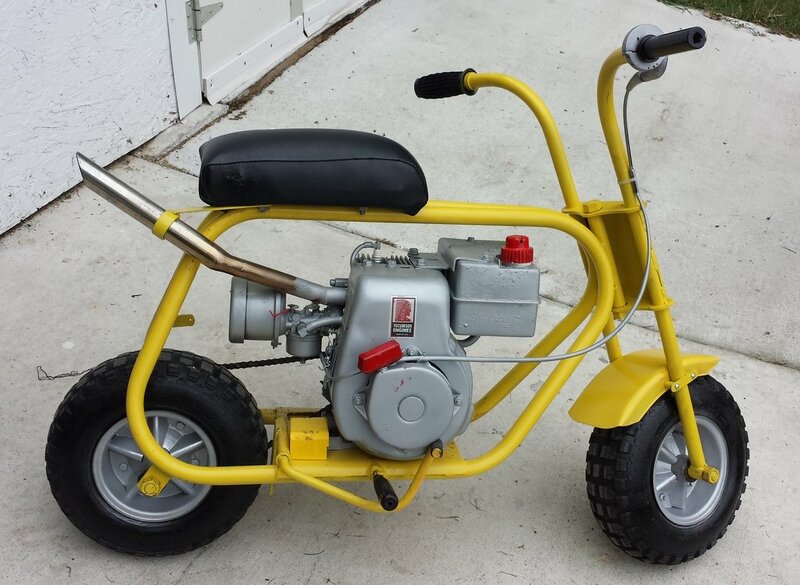 The "little gem" was not quite a turnkey machine, but with some elbow grease and some ebay surfing, this little screamer was lovingly restored to its former glory. I took delivery in August 2001. Motor was seized, missing scads of parts, no brake, cables, chain, carb completely oxidized shut. Pine needles were found to reside in the crankcase, and a Funky rear wheel replacement from a hand truck must have been installed for wheelies at some point. It's a PowerDyne Galaxie. Made in Pawtucket Rhode Island. In the 70's? 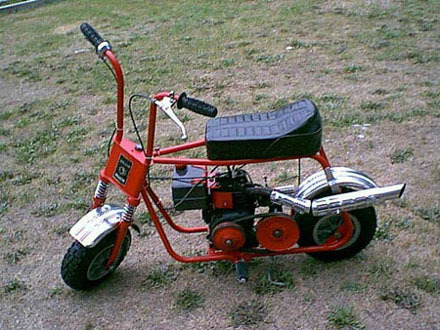 A strippo I think, no lights, no torque converter, no suspension, and a small 2.5 HP Tecumseh. After it sat in my shed for almost two years, Tim and I got down to business. With some sweat and parts procurement, here are the results! Believe it or not, the original engine was salvaged. I took apart the engine and pounded out the piston, sanded the bore by hand with 400 grit, replaced the piston rings, wrist pin, spark plug and ignition assembly with used engine parts from a litter of donated tecumsehs. The original crank journal was sanded and polished, the pine needles and aluminum oxidation were scoured away, and a new carb, air cleaner and muffler were procurred and fitted. The thing ran supah. 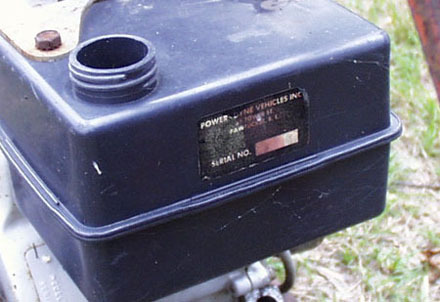 The first carb mentioned above was new, but it was the newer "emissions" type model without a choke. (Darn emissions carb). It was difficult to start even with the primer bulb. So eventually I found a snowblower carb with a choke. It's downright amazing how easy it is to start now, and I can get the engine to idle extremely low and smooth. Ahhhhhh. Color choice: Hammerite Blue paint for the frame, '67 Pontiac GTO engine paint for the engine (Yea, I'll get to the GTO some day, Mr Dunn). It's an amazing color match! And since I'm ever the motorhead, I decided to upgrade the muffler. The one I fitted was far too garden variety, so I whipped out my trusty Craftsman MAPP gas torch and fabbed up the beauty shown below with some electrical conduit and, yep, a WD-40 can. I brazed the flange and used solder on the "muffler". I think I should submit this idea to WD-40. Perhaps I'll win a prize. Can you say burn hazard? Yep, what a pipe. A one lung-er Harley sound. However, this gem didn't last; it seems Tecumseh engines can generate quite an amount of heat and after about 7 minutes of operation, the "muffler" shot off in a blast of molten solder. I spent a while peeling solder spatters off of the whole backside of the 'bike. So, I brazed everything and also experimented with offsetting the pipes internally to quiet this beast down. Now it emits a nice burbly tone. Jenny can just about do wheelies since she's packing 90 lbs less than me. This specimen has a fork with springs, torque converter, and a kick-arse tail pipe, inspiration for my muffler pipe attempt. Tim Miles who helped out with the rebuild. Jenny too for sanding the frame! Paul Porlier for location service and transportation. Foggy for the chassis donation. JClark for the litter of motor parts. 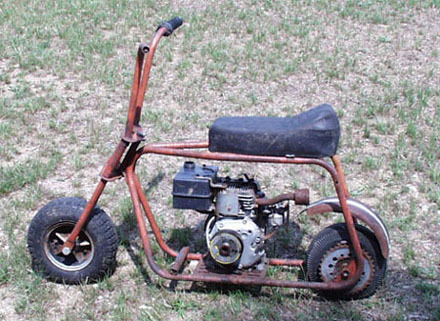 ".....Paul got this bike from me and I got your link from him. It looks great and I'm glad it when to a good home. You did what I wanted to but did it way better. Good luck and enjoy....." M.F. ".....Young Tim looks resplendent upon his charge.. with assuredness and confidence at speed......" L.T. ".....Do you really fit on that thing? Needs a 10 horse motor. Where are the flame decals?" P.E.D. ".....AWESOME !! you can wash and rebuild my lawnmower any day !! This thing is a gem, very nice, nitrous oxide would help things out tremendously..." B.D. ".....Let me know who gets the first tragic "muffler burn". I remember my first one...right down to the meat...." T.W. I made my exhaust with left over scraps of metal and had to make a bracket for it..." J Mosser.